For many years, nutrition professionals didn’t consider protein a priority for most Americans. The thought was that most people consume more than enough to prevent protein deficiency. But now a new perspective is gaining momentum. A growing body of research shows that a greater intake of protein may increase muscle synthesis, decrease muscle breakdown, boost satiety, and improve glycemic control, thereby enhancing muscle function and mobility, as well as assist in preventing and treating certain chronic diseases. The evidence regarding many of these health benefits focuses on high-quality proteins, including milk proteins, which many food manufacturers are adding to various dairy and nondairy products to enhance their nutritional value and improve consumers’ health. For optimal health, evidence shows Americans may need more protein than previously thought. Protein is the major structural component of all cells in the body and functions in the form of enzymes, transport carriers, and hormones. The body requires a steady supply of the nine essential amino acids from dietary protein to synthesize new proteins and balance the rate of protein breakdown. The Recommended Dietary Allowance (RDA) for protein, 0.8 g/kg of body weight per day for those aged 19 and older, is based on the minimal amount of protein required to prevent protein deficiency, not necessarily the optimal amount to promote health. The Institute of Medicine’s Acceptable Macronutrient Distribution Range (AMDR) for protein goes from 0.8 to at least 2.5 g/kg of body weight per day (or 10% to 35% of total calories from protein). Since protein needs are a function of lean tissue mass, not calorie intake, protein requirements should be calculated in terms of body weight rather than as a percentage of calories. This is critical with lower energy intakes: When calorie intake is low and protein needs are calculated as a percentage of calories, the amount of protein may be inadequate. Moreover, when energy needs aren’t met, protein becomes an alternate fuel source, which may increase protein requirements. It’s true that most Americans get plenty of protein: 1.2 to 1.3 g/kg/day, according to Douglas Paddon-Jones, PhD, a professor in the department of nutrition and metabolism at The University of Texas Medical Branch. However, providing the body with optimal protein goes beyond consuming a set amount per day. The body can use only a certain amount of protein at a time and can’t stockpile it for later use. “We need to get protein through a meal-driven approach,” he says. High-quality, or complete, proteins are comprised of all nine essential amino acids—those that the human body can’t manufacture on its own—in proportions similar to amino acid requirements. According to the 2010 Dietary Guidelines Advisory Committee report, animal products provide a greater quantity and quality of protein than plant products. This is particularly important when protein needs are high, such as during periods of growth and metabolic stress. Eating various plant foods may provide the full array of amino acids, but plant foods may not provide enough calories, which may result in muscle catabolism to meet energy needs. Whey protein has the highest biological value (the proportion of absorbed protein that’s retained in the body for maintenance and growth) of any protein, which means it’s highly usable by the body. Whey protein also is one of the richest sources of leucine, an essential and branched-chain amino acid that triggers initiation of muscle protein synthesis. 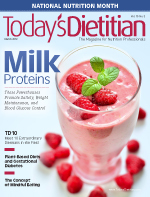 In light of protein’s health benefits, manufacturers are isolating various milk proteins, such as milk protein concentrates (MPCs), whey protein isolate (WPI), hydrolyzed whey protein, and whey permeate, and using them as ingredients in dairy and nondairy foods, and beverages such as milk, yogurt, energy bars, and cheese to boost their protein content. MPCs are complete dairy proteins that contain both casein and whey proteins. They’re produced from milk by a series of processes, including ultrafiltration, evaporation, and drying, and are available in protein concentrations ranging from 40% to 89%. MPCs with higher concentrations of proteins can be used to enhance a product’s protein content without adding significant levels of lactose and contribute valuable minerals such as calcium, magnesium, and phosphorus. MPC ingredients are desirable to fortify nutritional beverages, frozen desserts, cultured products, and others with protein and calcium. Whey protein can be isolated from milk or the whey by-product of cheese making. Whey protein concentrate (WPC) is manufactured by drying the material from the removal of sufficient nonprotein components from pasteurized whey, resulting in a product that contains 25% or more protein. WPI is manufactured by drying pasteurized liquid whey and removing nonprotein components (lactose, fat, and some vitamins and minerals) through various separation techniques, resulting in a product that contains 90% or more protein. Because WPI contains little lactose, those with lactose intolerance may be able to eat products containing it. Products with WPI ingredients include infant formula and sports drinks. Hydrolyzed whey protein, also called whey protein hydrolysates, is whey protein that has been treated with enzymes to break down either the protein into peptides and free amino acids or the lactose into simple sugars. It’s most commonly used in infant formulas, some sports drinks, and medical protein supplements to improve digestibility and reduce the allergen potential. Whey permeate (also called dairy product solids, deproteinized whey, or modified whey) is a coproduct of the production of WPC, WPI, ultrafiltered milk, MPC, or milk protein isolate. Whey permeate usually contains 65% to 85% lactose, 8% to 20% minerals, 3% to 8% protein, and 1.5% fat. Delactosed permeate is a by-product created by removing lactose from permeate. It contains about three times as much mineral content as permeate and about 60% lactose. Whey permeate enhances browning and flavor while improving moisture retention and reducing sodium levels. It’s commonly found in bakery products, instant soups, and milk-based drinks. The fact that dietary protein increases thermogenesis to a greater extent than carbohydrate or fat is well documented in the literature. Studies have shown that both casein and whey have a thermogenic effect.12 Coupled with the ability of milk protein to promote muscle mass, calorie expenditure may increase slightly and have a positive effect on weight management. Nutrient-rich meals that incorporate various foods from several protein sources in adequate amounts optimize the potential for muscle protein synthesis and weight maintenance, decrease chronic disease risk, and contribute to overall nutrient intake. Nutrition professionals can help clients get the protein they need when they need it by conveying the importance of consuming about 30 g (4 oz) of high-quality protein at each meal and providing related meal suggestions and recipes. Americans understand the benefits of protein, according to the International Food Information Council Foundation’s 2012 Food & Health Survey: Eighty-eight percent know that protein helps build muscle; 60% agree protein can help people feel full; and 60% believe a high-protein diet can promote weight loss. Nearly six of 10 consider protein when making a decision about buying packaged food or beverages. However, the focus for many (47%) is eating more protein during an evening meal rather than during other meals or snacks during the day. On average, Americans consume about 12 g of protein per day at breakfast, 23 g at lunch, 35 g at dinner, and 11 g from snacks. “The biggest obstacle—or opportunity—is breakfast,” Paddon-Jones says. “Breakfast items such as eggs, Greek yogurt, and a latté are great, but a lot of us need something convenient and simple.” He recommends adding WPC, WPI, or skim milk powder to foods such as a fruit smoothie but to avoid whey supplements that target bodybuilders because they contain other ingredients that aren’t necessary. Foods naturally rich in high-quality proteins include lean meats, poultry, fish, seafood, dairy foods, and eggs. Leucine is found in dairy foods, legumes, beef, salmon, shrimp, chicken, eggs, and nuts such as peanuts, almonds, and walnuts. Milk protein ingredients are added to some foods that are naturally rich in high-quality protein, such as milk and yogurt, to further enhance their nutrition profile or add functionality (see below). Greek yogurt is particularly high in protein: 13 to 18 g per 6 oz, about twice the amount of regular yogurt. The authentic straining process packs in both casein and whey, according to Kara Lydon, RD, LDN, health communications manager for Chobani. “Like milk, Greek yogurt contains a higher ratio of casein to whey protein: about three to one,” she says. Lydon suggests always having a convenient source of high-quality protein on hand, such as nuts, string cheese, or Greek yogurt. Chobani’s website (www.chobani.com) offers recipes, a recipe ingredient conversion chart, and cooking videos. Cottage cheese has the highest amount of leucine of any dairy food, according to Laura Hershey, MBA, RD, health and nutrition manager for Daisy Brand Cottage Cheese. It contains about 14 g of protein (more protein per ounce than Greek yogurt) and 1.3 g of leucine per 1/2 cup, and is about 90% casein and 10% whey. Daisy Brand Cottage Cheese’s website (www.daisybrandhealth.com) includes food pairing suggestions, recipes developed by RDs, and patient education materials. A relatively new product on the market is Core Power, a low-fat, lactose-free milk that contains 26 g of protein, including 21 g of casein and 5 g of whey, per 11.5-oz serving. Through a cold-filtration process, the milk solids in fresh milk, such as protein and calcium, are concentrated. — Karen Giles-Smith, MS, RD, is a freelance writer based in Michigan and the health and wellness editor for Dairy Foods magazine. Her 23-year career in nutrition has encompassed clinical dietetics, nutrition education, and nutrition communications. Products containing milk and whey protein ingredients are available at retail stores. Manufacturers add milk and whey protein to energy bars, drink mixes, yogurt, and beverages. Most protein-enhanced bars and beverages contain 8 to 30 g of protein per serving. Milk protein concentrate, whey protein concentrate, and whey protein isolate also are available in powder form and can be added to recipes or beverages, smoothies, oatmeal, yogurt, soups, sauces, and dips. Manufacturers use milk protein ingredients for three general applications: to add viscosity, texture, and taste to products and provide a clean label listing fewer ingredients with familiar names; to provide significant nutritional value to nutrition bars, beverages, and fresh dairy products; and to offer the health benefits that bioactive proteins provide. In light of the interest in health and wellness, and the fact consumers are demanding more value from their food and beverage products, the use of dairy proteins in the US market has increased and demand has accelerated across the globe, according to the US Dairy Export Council. The global whey market outperformed most nutrition sectors, growing 20% in 2011, mostly due to high-end products such as whey protein concentrates, isolates, and hydrolysates. *For this and other whey protein-containing recipes, visit http://wheyprotein.nationaldairycouncil.org. 1. Symons TB, Schutzler SE, Cocke TL, Chinkes DL, Wolfe RR, Paddon-Jones D. Aging does not impair the anabolic response to a protein-rich meal. Am J Clin Nutr. 2007;86(2):451-456. 2. Layman DK. Dietary guidelines should reflect new understandings about adult protein needs. Nutr Metab (London). 2009;6:12. 3. Symons TB, Sheffield-Moore M, Wolfe RR, Paddon-Jones D. A moderate serving of high-quality protein maximally stimulates skeletal muscle protein synthesis in young and elderly subjects. J Am Diet Assoc. 2009;109(9):1582-1586. 4. FitzGerald RJ, Murray BA, Walsh DJ. Hypotensive peptides from milk proteins. J Nutr. 2004;134 Suppl 4:S980-S988. 5. Aimutis WR. Bioactive properties of milk proteins with particular focus on anticariogenesis. J Nutr. 2004;134 Suppl 4:S989-S995. 6. Rodriguez NR, Garlick PJ. Introduction to Protein Summit 2007: Exploring the impact of high-quality protein on optimal health. Am J Clin Nutr. 2008;87(5):S1551-S1553. 7. Claessens M, van Baak MA, Monsheimer S, Saris WH. The effect of a low-fat, high-protein or high-carbohydrate ad libitum diet on weight loss maintenance and metabolic risk factors. Int J Obes. 2009;33(3):296-304. 8. Dietary Reference Intakes for Energy, Carbohydrate, Fiber, Fat, Fatty Acids, Cholesterol, Protein, and Amino Acids. Washington, DC: National Academies Press; 2002:843. 9. Layman DK, Walker DA. Potential importance of leucine in treatment of obesity and the metabolic syndrome. J Nutr. 2006;136(suppl 1):S319-S323. 10. Anderson GH, Luhovyy B, Akhavan T, Panahi S. Milk proteins in the regulation of body weight, satiety, food intake and glycemia. Nestle Nutr Workshop Ser Pediatr Program. 2011;67:147-159. 11. Leidy HJ, Lepping RJ, Savage CR, Harris CT. Neural responses to visual food stimuli after a normal vs. higher protein breakfast in breakfast-skipping teens: a pilot fMRI study. Obesity. 2011;19(10):2019-2025. 12. Acheson KJ, Blondel-Lubrano A, Oguey-Araymon S, et al. Protein choices targeting thermogenesis and metabolism. Am J Clin Nutr. 2011;93(3):525-534. 13. Cermak NM, Res PT, de Groot LC, Saris WH, van Loon LJ. Protein supplementation augments the adaptive response of skeletal muscle to resistance-type exercise training: a meta-analysis. Am J Clin Nutr. 2012;96(6):1454-1464.